Although Begonia semperflorens - better known as the wax begonia - is a tender perennial, it is used primarily as an annual bedding or container plant because it will not tolerate freezing temperatures. These plants have become very popular with gardeners around the world because of their continuous bloom and lush foliage. 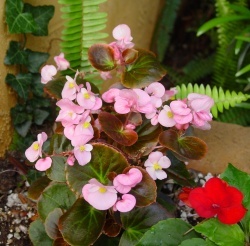 Wax begonias come in shades of white, pink and red. The flowers are held well up off the foliage in generous loose clusters. Individual blossoms are mostly single, but some varieties sport double flowers. The shiny leaves vary from light green through dark bronze - some are variegated. Standard wax begonias can attain heights up to 18 inches and more, but there are newer dwarf varieties that are only 6 inches high which makes them ideal for borders or edging. Plants enjoy rich well drained soil in partial sun to partial shade. Some of the newer cultivars will also grow in mostly sunny locations. To maintain optimum growth and flowering, they should be watered regularly to keep the soil evenly moist, but will tolerate some periods of dry conditions. Wax begonias are fast growers. They tend to get a little leggy if grown in shade. Pinch tops to promote compact growth and bushiness. Because germination and growth from the fine seed can take up to six months to produce plants large enough to set outside, it is best to purchase your wax begonias in pots or flats when available in late spring. When planting outdoors, wait until night temperatures remain at 50 degrees or higher. Set plants 8 to 10 inches apart in groups or rows. Fertilize lightly about 10 days to two weeks after planting and again in September. Healthy plants rarely are bothered by pests. However, slugs like the succulent stems and leaves and spider mites may appear if kept too dry. Check you plants often to keep ahead of problems. The best way to propagate wax begonias is from cuttings rooted in moist sand or seedling mix. Take 3 to 5 inch tip or stem cuttings and remove the lower leaves. Insert about one to two inches in rooting medium, covering the first leave node. You should see the beginnings of new roots within a week to ten days. Rooting hormone is not necessary, but helps produce a stronger root system. You can overwinter wax begonias indoors by potting up individual plants or taking cuttings in late fall before the first frost. Place on a bright sunny window sill and you will be able to enjoy their blossoms during the bleak winter months plus have established plants to put in your garden the following spring.